This is the second of two books I read while on holiday in France. The first was The Givenness of Things by Marilynne Robinson. More of that in another review post. Suffice to say that one of the main themes of Robinson's collection of essays is what it means to be human. In the first essay on Humanism, the author disagrees with the view of some Neuroscientists who conclude that the human "self" does not exist. What we think of as "self" is merely the product of electronic impulses generated by that computerised piece of meat, the human brain. Robinson prefers the account given by "the brilliant young humanist scholar, John Calvin...in his praise of 'the manifold agility of the soul, which enables it to take a survey of heaven and earth; to join the past and present; to retain the memory of things heard long ago; to conceive whatever it chooses by the help of imagination; its ingenuity also in the invention of such admirable arts'". (p. 26). The question of what it is to be human also haunts Ishiguro's novel. The story is narrated by Kathy H, a thirty one year old carer. The novel unfolds as Kathy reflects on 'the memory of things long ago' in an attempt to make sense of her current situation. Her life story begins in Hailsham, a special boarding school. While there Kathy made friends with fellow boarders, Tommy and Ruth. The story is limited by her perspective on things as Kathy reminisces about the past until her story merges with the present. Other than that, no explanation is given of how the dystopia Ishiguro has created came about. Slowly the reader begins to grasp that all is not right with Kathy's world. It becomes apparent that Hailsham children were 'donors', a class of people created by cloning as living spare parts. Their destiny was to grow into adulthood and then have their vital organs removed one by one until they died, or 'completed'. Before donating they could serve as carers, hence Kathy's position. Hailsham students could never understand why the art they made was removed from the school and placed in a gallery. A rumor spread that exhibits in the gallery were there to prove that two Hailsham students had fallen in love once they reached adulthood. Genuine couples could be granted some extra time together before donating. Ruth, Tommy and Kathy certainly believed this to be true. Later in life Kathy hears that Hailsham had closed down. However, Together with Tommy she manages to track down Miss Emily and Madame from the school. They are desperate to find out whether the rumuor about the gallery was true. It turns out that what made Hailsham special was that the school pioneered a more humane way of treating 'donor' children, believing them to be fully paid up members of the human race, rather than living spare parts. The art in the gallery was not there to give in an insight into lovers' souls, but to 'prove you had souls at all' (p. 255). Calvin would have approved of that as an indication of genuine humanity, but not of the need for it in the case of Kathy et al. Kathy and her friends are depicted as truly and fully human, not soulless automatons. They form close friendships, they fall in and out of love, they are kind and they are cruel, they create art and literature, they long for a sense of meaning and purpose in life, they want to know where they came from and where they are going. 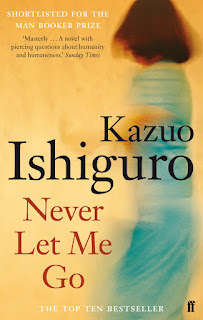 Ishiguro's tenderly drawn characters are flawed, sometimes frustrating, yet lovable human beings. Like us. But destined to die a cold, unnatural death. The writer deploys a 'show not tell' approach to the moral issues raised in his novel. It does, however, provoke some serious bioethicical questions. Currently, embryonic stem cell research involves the harvesting of stem cells from human embryos prior to their destruction. In most cases these embryos are 'surplus to requirements' in IVF treatments. Although some have been created by cloning simply for stem cell research purposes. Human life in its early stage has become a thing to be used. And that while stem cells may be taken from adult tissue and deployed to good therapeutic effect. There is mounting pressure to press ahead still further with embryo experimentation for therapeutic and even reproductive purposes. Let's hope the alternative past portrayed in these pages doesn't become a chilling prophecy of the future. I'm not aware of Ishiguro's faith position. Reading his novel through Christian eyes, it is a powerful testament to the worth, dignity and value of human beings, made in the image of God. As such it is a protest against seeing people as products to be utilised rather than souls to be loved. The title of the novel is taken from Kathy's favourite song, which is emblematic of the deep seated human need for security in love. There is One who will never let us go, John 10:27-29.